We love our beautiful green space and invite you to enjoy this sanctuary of peace. Being an accredited Green Sanctuary is one of the ways Starr King works toward our vision of a healthy and sustainable future. Environmental Justice: We partner with local organizations and the UU Ministry for Earth to reach out to marginalized communities who are hit first and hardest by environmental crisis. If you feel the call to environmental justice, consider getting involved! Worship and Celebration: As we work together towards a cleaner, more just, and sustainable world, worship inspires our work and reminds us of what is most sacred and most true. Take a “nature bath” in our garden, and enjoy our annual Earth Day Fair. Religious Education: Our workshops and programs for all ages shape attitudes and build practices that are sustainable and spiritually-grounded. Our youth are learning to grow their own garden! 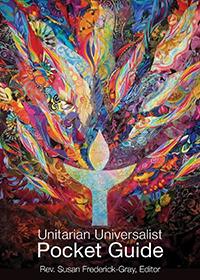 The Green Sanctuary Program is an accreditation process sponsored by the UU Ministry for Earth. We achieved the status of Green Sanctuary in 2010. Our Green Sanctuary Committee continues to keep this principle alive in our congregation. Worship Committee ensures we keep environmental topics in our worship services and even makes sure to purchase sustainable candles!